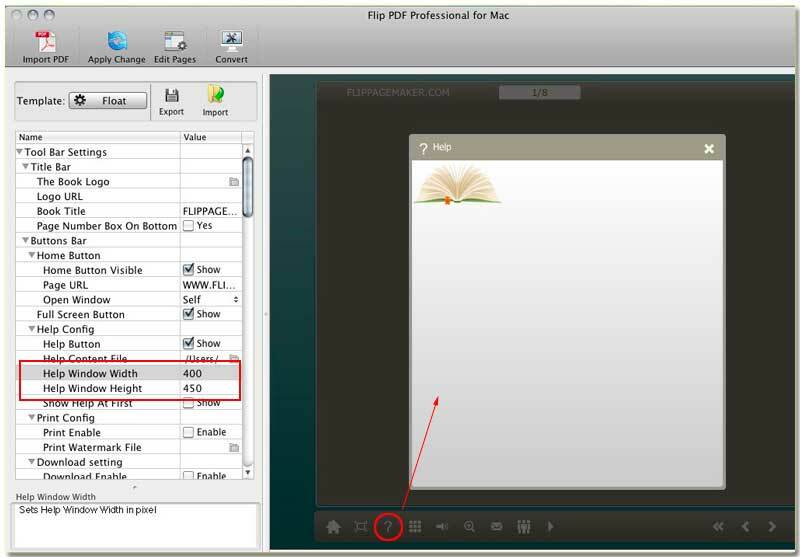 How to resize the Help window of MAC version flipbook? You know, if enable readers to get the important information from the help window, first you have to prepare an image on which print some description to import. In fact, you should adjust the help window size to fit the image size so that it looks well. If the picture is small but has a unsuitable container (help window), either you or me will feel uncomfortable and doubt the professionalism. The authority is shaking due to the careless make you upset. Anyway, we will try best to avoid this kind of mistakes. Step1: Start FlipBook Creator for MAC, import PDF and edit it. Step2: find the options Help Config from the left most settings place on the software interface. Step3: Setup the Help Window Width/Height in pixel. It would be best if the width and height are the same as the help information carrier the image.